Candlelight Supper: Joyeux Noel! Merry Christmas To You!!! I saw these cute little plates at Barnes and Noble and thought with the number 25 on them they would make a cute little Christmas plate. I think it is supposed to be a Postage stamp. But I love using unconventional things in a conventional way. Christmas cards below from Barnes & Noble as well. I am using them as Menu cards. If you follow my Blog you will know that I love the surprise of Christmas Party Crackers, with their SNAP, prizes, hats and jokes inside. World Market had these that say Joyeux Noel on them. I am using 2 goblets at each place. 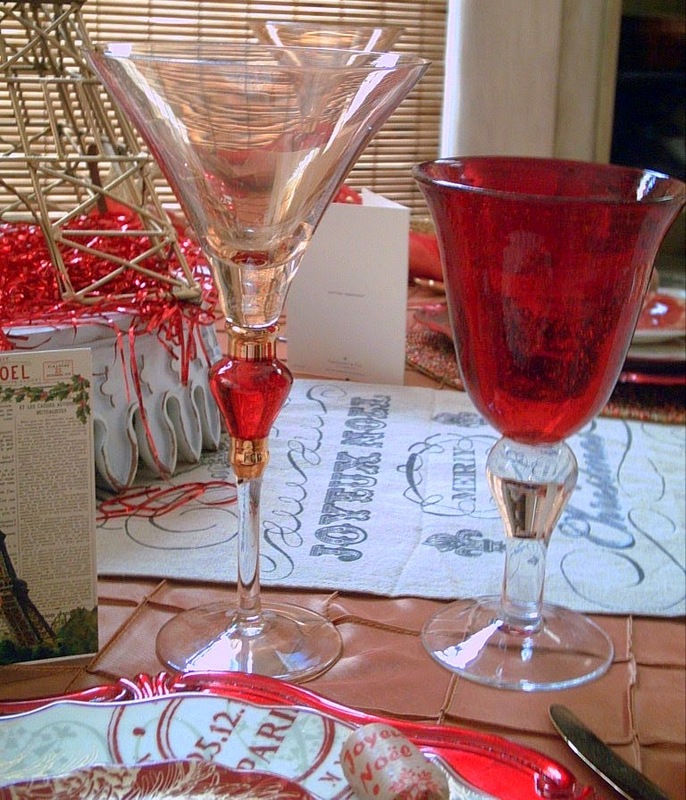 A water glass, and a martini glass. The martinis glass really appealed to me because of the shape and line of the glass. If it was turned upside down the glass would resemble the Eiffel Tower. Mine will hold a shrimp salad. Again I love using items in a different way than their intended purpose. You could easily serve a dessert in them. How great to moisten the rim and dip in red sugar and put a wonderful dessert inside the glass! 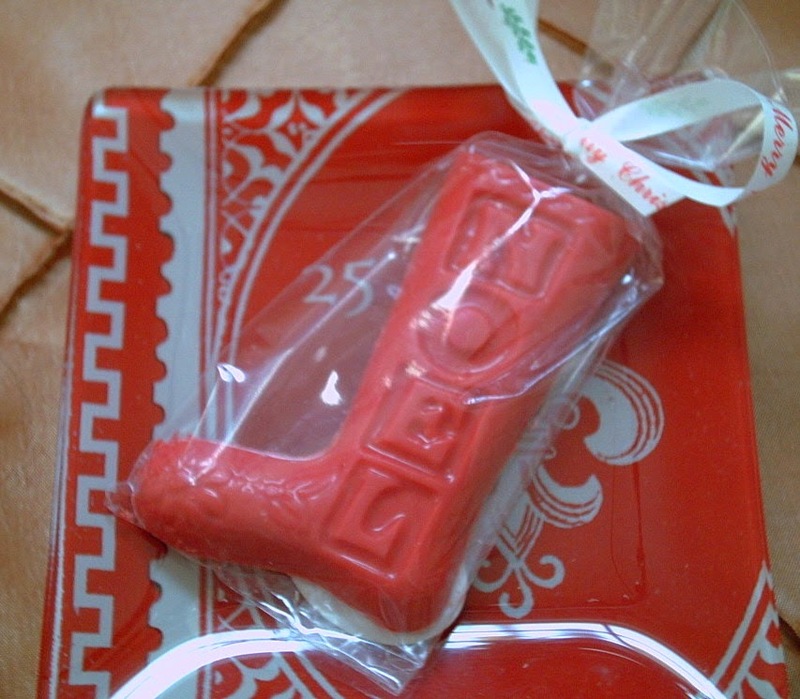 A little take home gift of a Santa boot with the word Noel molded in the chocolate. Close-up of the base that is supporting the Eiffel Tower. Purchased at Home Goods. I have actually turned it upside down for this use. Three views of the linen/burlap runner. Love the detail There are crowns, a coat of arms, French script, English script. 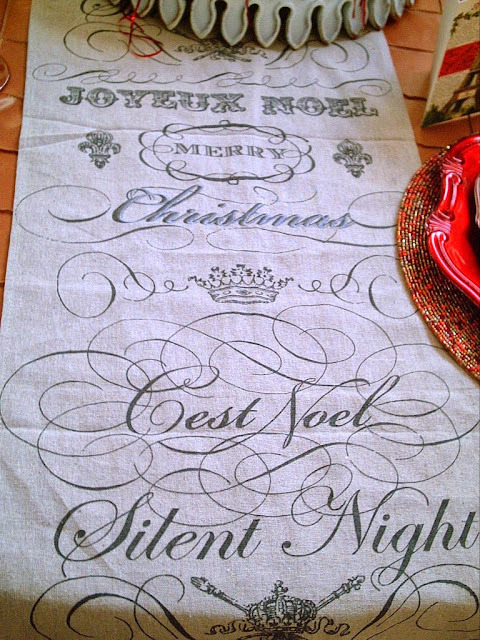 The word Christmas is actually embroidered, not printed on. Done is a silvery gray thread. 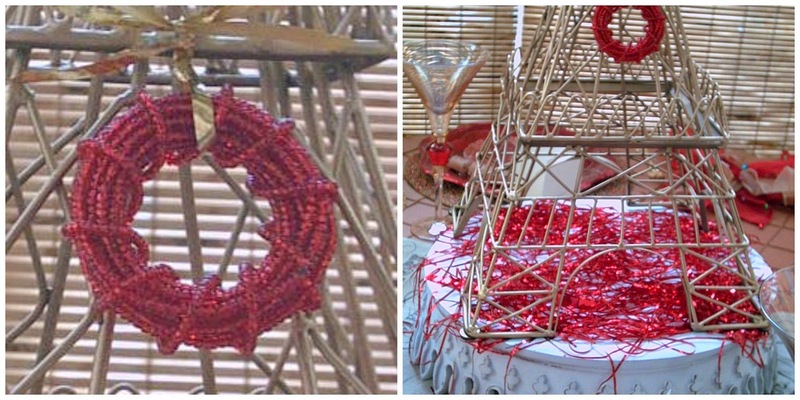 I used a little beaded napkin ring to hang a wreath on the Eiffel Tower. La Bonne Vie! The Good Life! 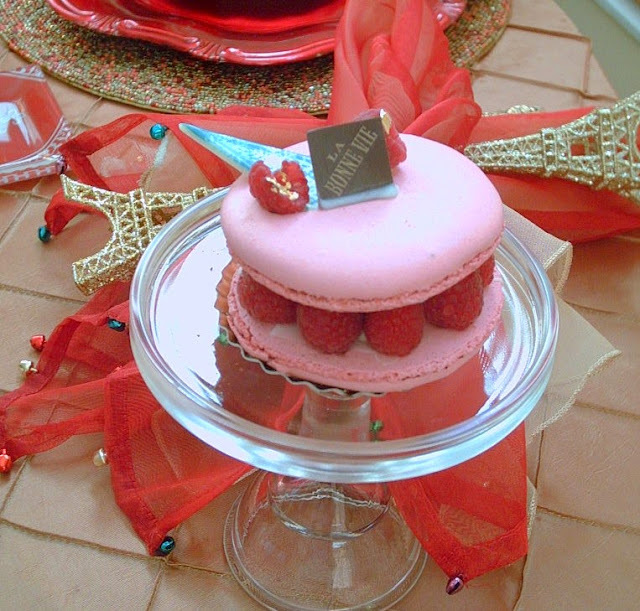 I am serving a variety of French pastries from a little French Bakery, La Bonne Vie, located in the Grand America Hotel. 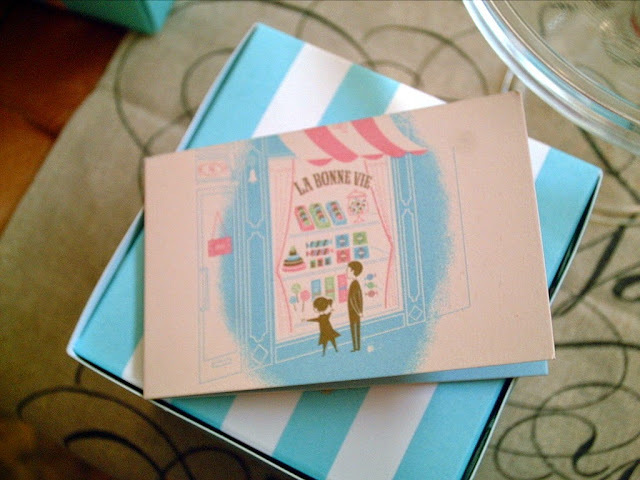 They box up your sweet treats in an adorable blue stripe box, with ribbons and a gift card. Look at this Divine pink and red Macaron. Filled with Almond cream and loaded with raspberries. The top decorated with hand made details, including a touch of edible gold foil. How could anything be more pretty? If you are a chocolate lover then this tart is for you! The deepest richest chocolate imaginable. 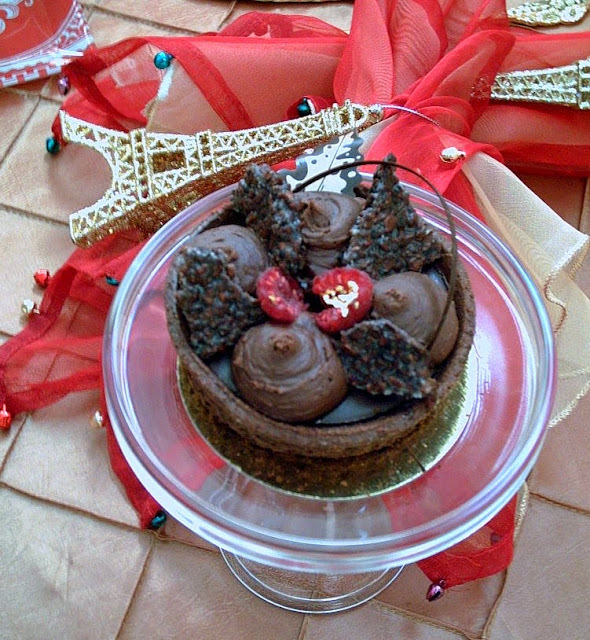 Chocolate crust, chocolate mousse, and the top loaded with individual chocolates. Joyeux Noel! Merry Christmas! Peace & Love. I love comments! Please feel free to make a comment below. I had such fun doing this tablescape. I was really looking forward to doing this theme. Partial List of sources for these items. Eiffel Tower, Hobby Lobby. Runner, Thanksgiving Point a year ago. Placemat, napkins and charger, Pier One. 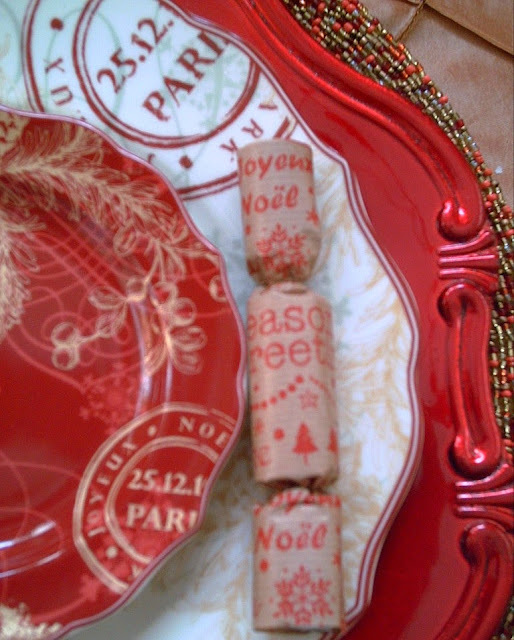 Eiffel Tower ornaments used as napkin rings, World Market. Glasses, Home Goods. Joyeux Noel plates, Ebay. 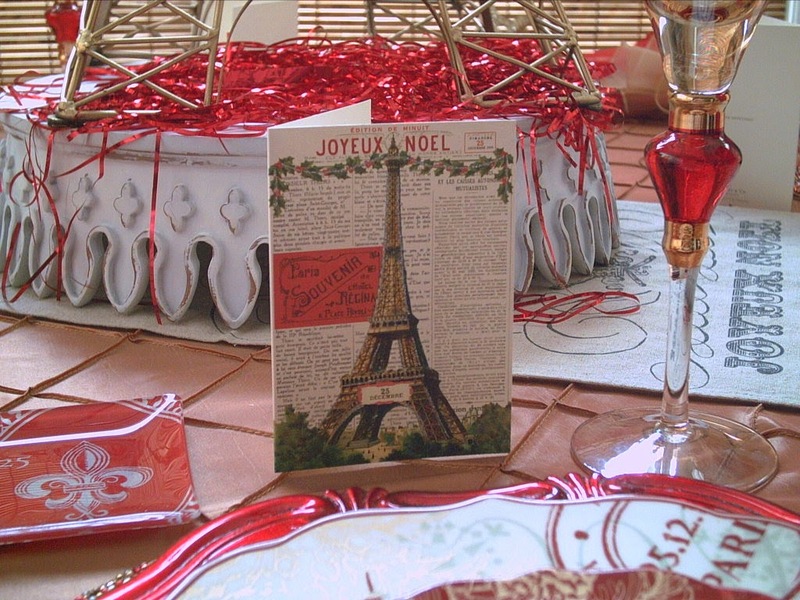 Eiffel Tower cards and little plates, Barnes & Noble (who knew!). Desserts Grand America Hotel, at their little French bakery Le Bonne Vie. 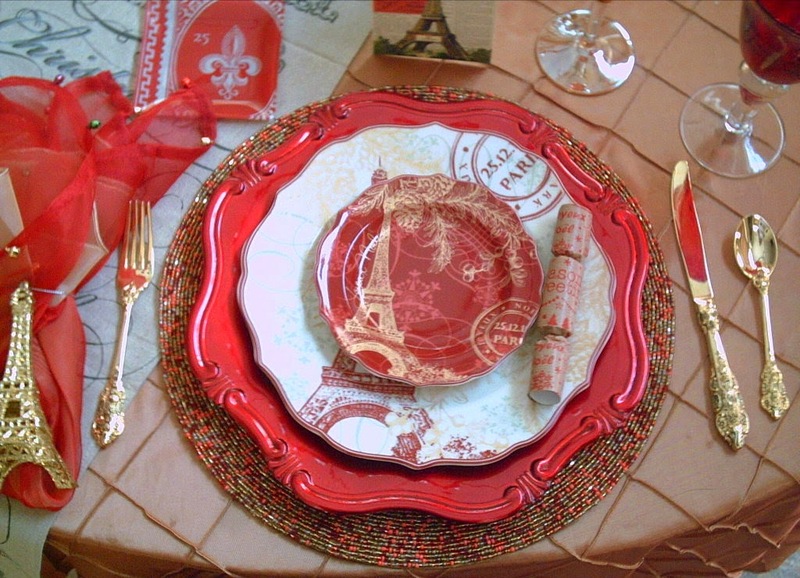 Valerie, I loved looking at your table as my table is currently set with the same theme. Please watch for my post in the next couple of days. Turning the crown base upside down is inspired. 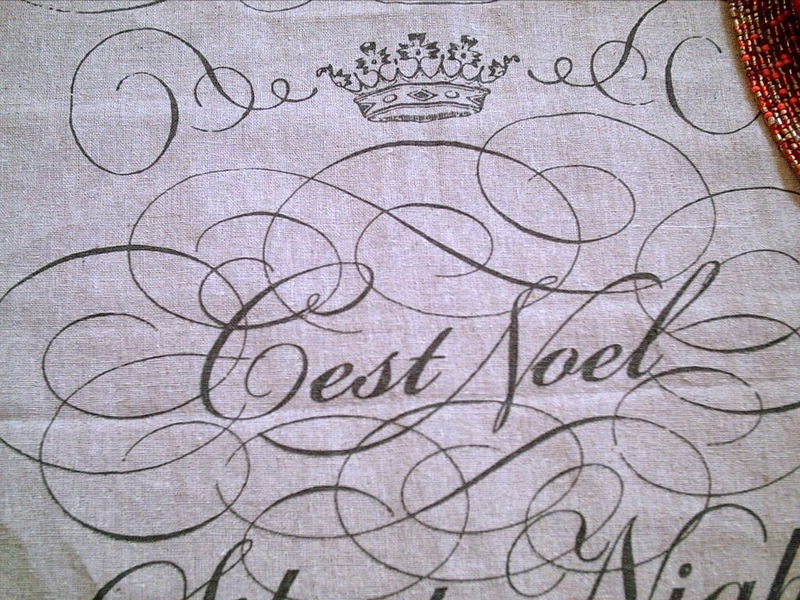 Joyeux Noel to you. I really like the runner a lot. So beautiful and perfect for the occasion. And the word Christmas is actually embroidered on? Lovely! That makes it even more special! I love the plates...all of them! 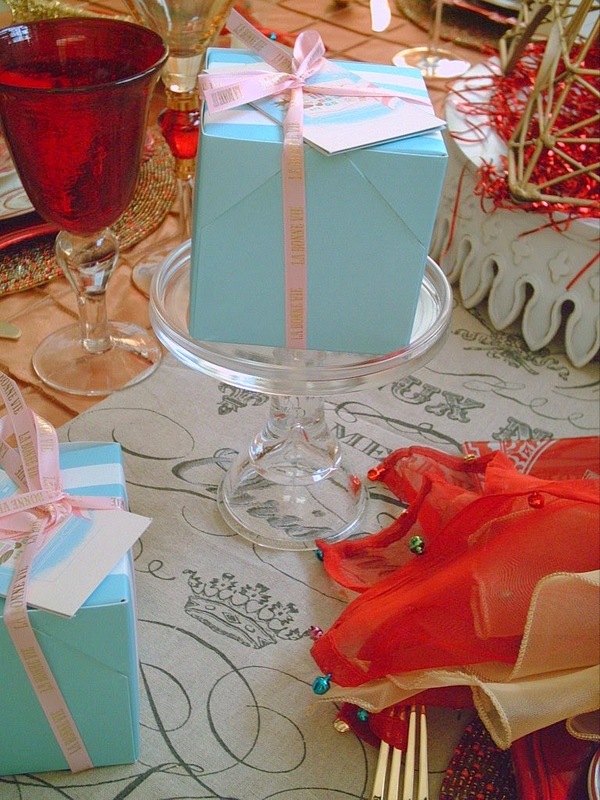 And don't EVEN get me started on those napkins and napkin rings!!! Those are exquisite!!! I like to have crackers, too. I use them at Christmas, sometimes on New Year's Eve, and it we get takeout and celebrate Chinese New Year. They look great, are a fun favor, and can add so much to the tablescape when judiciously chosen for their outward appearance. So you're a Home Goods shopper, too? Wouldn't have it any other way! That place rocks me to my very core! There has never been a time I've walked in there and not been able to find something. ALWAYS a pleasure to drop in that place!!! Thank you so much for stopping my blog earlier today. I so appreciate your visit, and I look forward to chit chatting back & forth with you in the new year. Merry Christmas to you and yours!!! 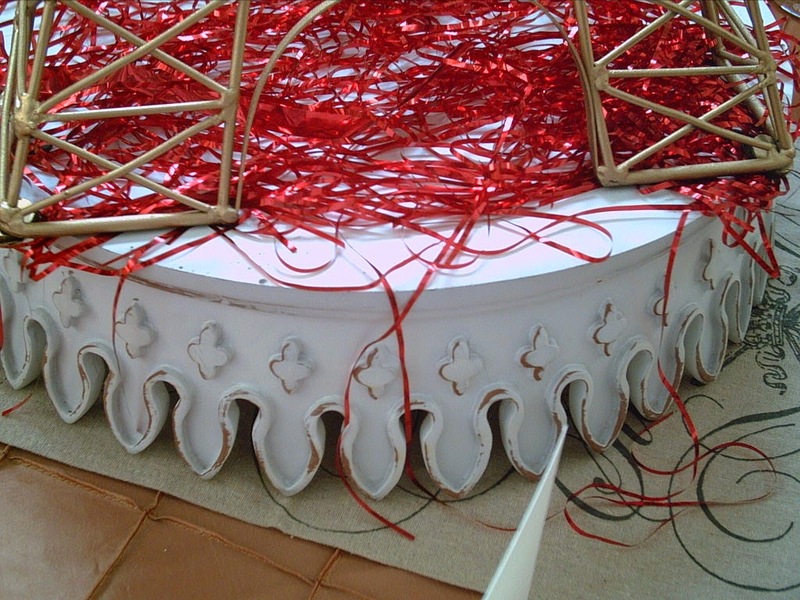 Forgot to rave about the inspired use of the napkin ring as a "wreath" on the tower. What a great idea!!! There are so many wonderful items here, and I love that you pulled them from so many different sources, and used them so creatively. Although one of the tiniest elements, that red "wreath" on the tower is my favorite. 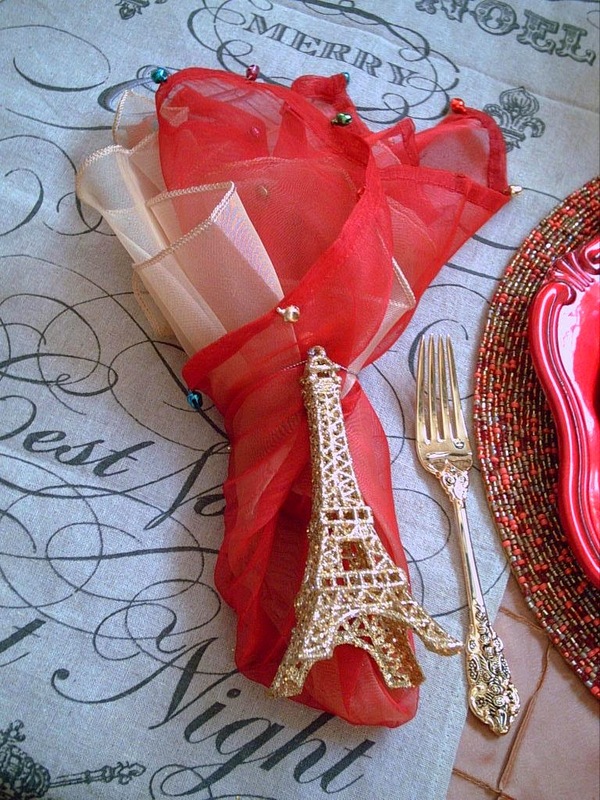 Valerie, your Paris themed table is charming. I love the little stamp plates. 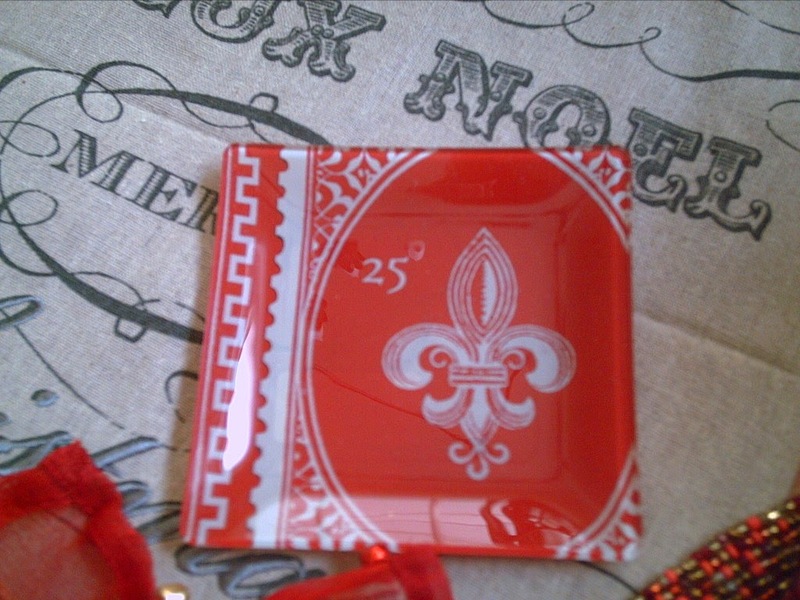 How perfect that they are red and have 25 on them. Merry Christmas! Your table is gorgeous and breathtaking! I was amazed by everything. 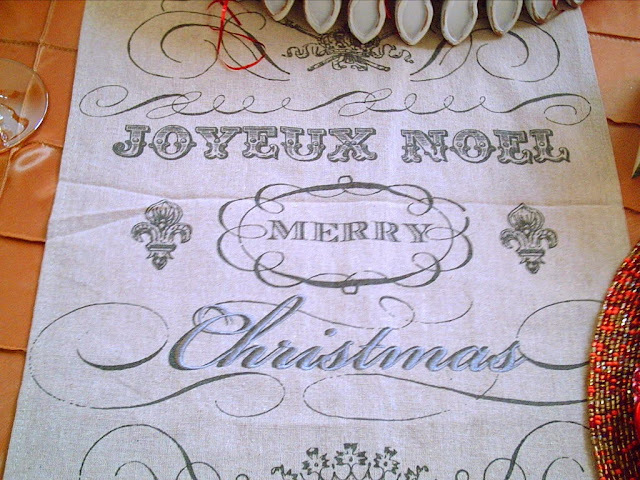 I searched high and low for the table runner, I found it today @houzz.com. Of course the Christmas is not embroidered but, I can do that myself. I also think it is tan instead of gray. They had one more left. Thank you for sharing all the wonderful information and have a blessed holiday season.